I know if I’m ever attacked by a grizzly bear, the first thing I’ll think of is a magazine article I read when I was a kid. I guess it ain’t braggin’ if you can do it. Simply stick your right arm in here. GREAT FALLS, Mont. (AP) — A Montana bow hunter is recovering after he survived a grizzly bear mauling by remembering a tip from his grandmother and shoving his arm down the animal’s throat. Chase Dellwo, 26, was hunting with his brother northwest of the town of Choteau on Saturday when he came face-to-face with a 350- to 400-pound male grizzly. Dellwo was walking up a creek bed, hoping to drive a herd of elk to a ridge where his brother was waiting. He was only 3 feet from the bear when he noticed it. He said the grizzly had been sleeping and didn’t see him coming, possibly because of the snow, rain and 30 to 40 mph winds. 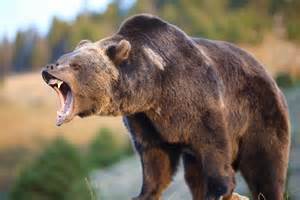 Dellwo said he only had time to take a few steps back before the bear knocked him off his feet and bit his head. “He let go, but he was still on top of me roaring the loudest roar I have ever heard,” Dellwo said. The advice worked, and the bear left. Dellwo rejoined his brother, who drove him to a hospital. Dellwo received stitches and staples in his head, some on his face, a swollen eye and deep puncture wounds on his leg. “I want everyone to know that it wasn’t the bear’s fault. He was as scared as I was,” Dellwo said. OK. I’m totally fine with hunting, but “snow, rain, and 30 to 40 mph winds?” And exactly what comfort are we to draw from the notion that “it wasn’t the bear’s fault.” At the risk of being some sort of a Monday morning quarterback, I gotta disagree: the bear could not have been as scared as you were. Bears are not the only animal to poop in the woods. Signs of the times. Not a Photoshop… Taken with an iPhone on Rt. 101 in Thousand Oaks, California this week.H/T to B. Scott Send this article to a friend. Dept. of Homeland Security moves military equipment through Arizona.